I found some in older threads of some of the very ones I have stored in the basement. One of these days I'll go down and open the box and show the others. I bought these used, but they still look brand new!! I had some without the floral design, new, but Igot 6 of these because I lost the others in storage & I love them!! 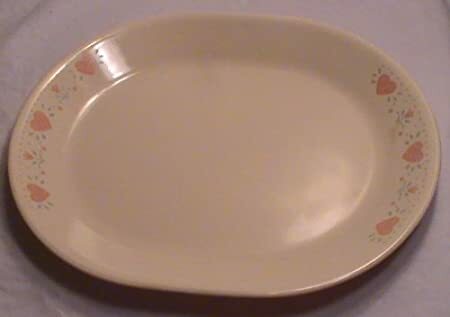 That Corelle platter rings a bell. I'll try and get pictures of my others later Lucky. Right now I'm entertaining the grandies while Mommy mows. Not plates, but as I was washing dishes and putting away, I thought I'd share these. 3 piece set of Pyrex bowls. I use them for storing fresh made salads and leftovers. Last edited by Luckytrim; 10-10-2018 at 07:34 AM. We were suppose to move to Myrtle Beach in September. We sold almost every plate pot, & pan in our house. I do have one cup I cherish. I bought it during a trip to the Avenue of the Giants in Humboldt County. These redwoods were amazing. Hey Sass ! Two New Items, and they MATCH !! I'll show you some things I've collected recently, as soon as I get them down from the top cupboard. I bought a crystal bowl. Heavy. I'll use it for trifle. The one in the back is very heavy crystal. The others I believe are crudites platters. Stopped by a church rummage sale yesterday afternoon and found these. Poor lonely things just sitting there with no mates. DIL bought a crock insert, different thread coming on that. I found a black nylon hand whisk too. Does that top plate have a ruffled edge? Very pretty. That's why I snatched it right up. And a Food Network ceramic skillet. Someone loved this skillet and took good care of it. Not one bit of damage. 1 dollar! Nice score on that skillet, Sass!